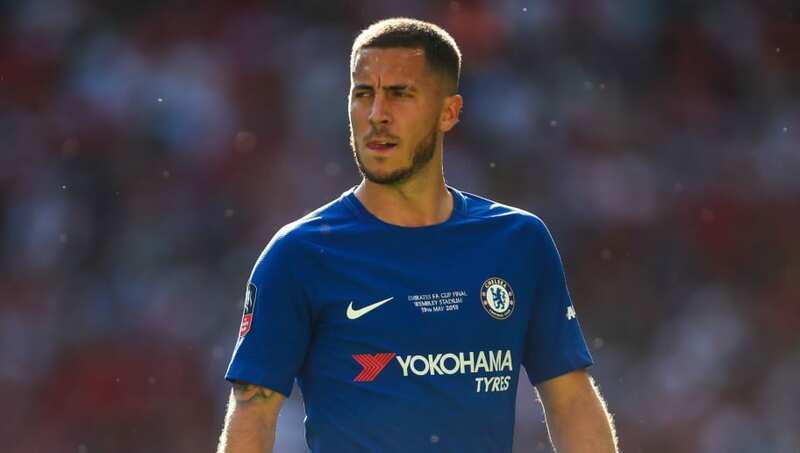 ​​Real Madrid are preparing to table an opening offer of £112m to ​Chelsea for the services of Eden Hazard, while Cesc Fabregas has urged the Blues to resist their overtures and keep hold of their star man. The Belgium international's links to the Spanish giants have increased exponentially following the end of his World Cup duties, having been identified as one of Real's top targets following ​Cristiano Ronaldo's €100m move to Juventus. The 27-year-old has made no secret of his desire to one day play for Real Madrid, and with moves for Paris Saint-Germain's Neymar or Kylian Mbappe proving difficult, Hazard has emerged as the next man on the Spanish side's wish list. The Blues are said to be 'very relaxed' about the situation as they feel as though the ball is in their court with Hazard unlikely to force a move away, unlike their situation with goalkeeper Thibaut Courtois who has just a year remaining on his deal at Stamford Bridge. The Premier League outfit are resigned to losing their shot stopper with Real confident of completing a £35.5m deal. With Hazard's situation less clear, Fabregas has admitted to seeking contact with the star winger as he encouraged the Blues to do what they can to keep him in London beyond the summer. “I won't lie, I speak to him often,” said Fabregas, via the Telegraph. Chelsea's new boss Maurizio Sarri is expected to wait until Hazard returns from his summer break on August 6 before speaking directly to his player.